Disaster Recovery as a Service (DRaaS) combines the best of cloud computing and expert support for systems-uptime. We all face a growing need for systems-uptime. Customers, suppliers, partners and regulators expect and demand it. Extended downtime is no longer a minor embarrassment – it can significantly damage your reputation and translates directly to lost revenue. Disaster Recovery as a Service makes this a thing of the past. Pay for disaster recovery when you need it. Disaster Recovery is one of the best uses for cloud computing. The demand for computing resources varies from very little for months and then a sharp rise for a short period. With DRaaS, you only pay for the resources when you need them. Draft in experts when you need them the most. Disaster Recovery is ideal for outsourcing. It’s repetitive, specialised and requires a pool of skilled experts to be called into action as needed. You won’t need to rely on it often - but when you do, it has to go right. You can focus internal efforts on innovative technology adoption and adding value to the business knowing that when disasters do happen, there’s a team on-hand ready to deliver for you. No queues or call centres. Just expert support whenever you need it. Most people don’t make restores every day. But most people aren’t Databarracks support engineers. The experience of performing thousands of restores makes your support team true experts. You get a dedicated engineer who is technically brilliant and personally invested in protecting your critical systems. There’s no such thing as ‘above and beyond’ for our engineers because they only work to one standard: to keep your systems running perfectly. We'll work together to understand which elements of your environment need protecting, and to what degree. We then build a plan that's cost-effective and attends to your needs. Design workshops cover the specifics of connectivity, monitoring, capacity planning and SLAs. We'll discuss exactly what's in and out of scope, and which services and capabilities the solution is built on. We outline the project in detail, so there are no surprises. We'll do most of the heavy lifting, and hold weekly progress meetings to keep everyone on the same page. Once the bones of the solution are in place, we carry out extensive testing to ensure the technology works, the connectivity is stable, and the SLAs are achievable. Finally, we'll set up the points of contact for ongoing support and service delivery. Forget anonymous support email addresses and phone lines. You get direct access to named individuals, with clear lines of escalation and support processes. Working with Databarracks has made us more aware of what’s at stake if our vital systems go down. We’re not just better protected from a technology point of view, we’re also better informed. It’d be hard to cope without them in a disaster now. By some distance, these guys are the best I deal with. Select a technology and provider to see which solution works best for you. Hypervisor-level replication to Databarracks’ vCloud powered environment hosted from ex-military nuclear Bunkers. 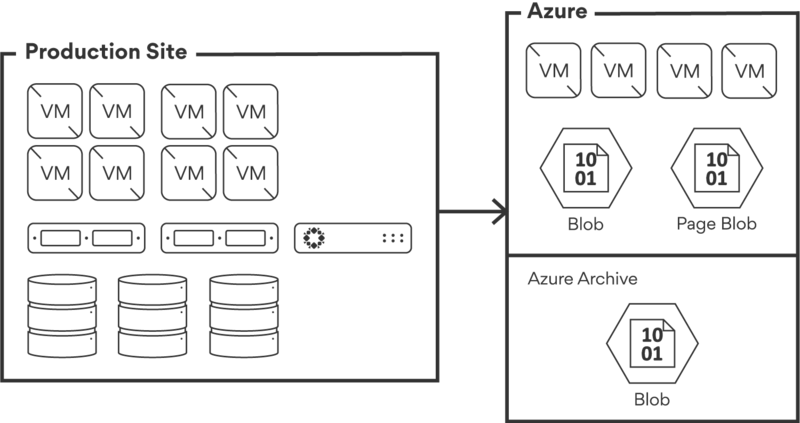 Zerto pioneered hypervisor-level replication bringing enterprise-level disaster recovery to virtualised IT environments. 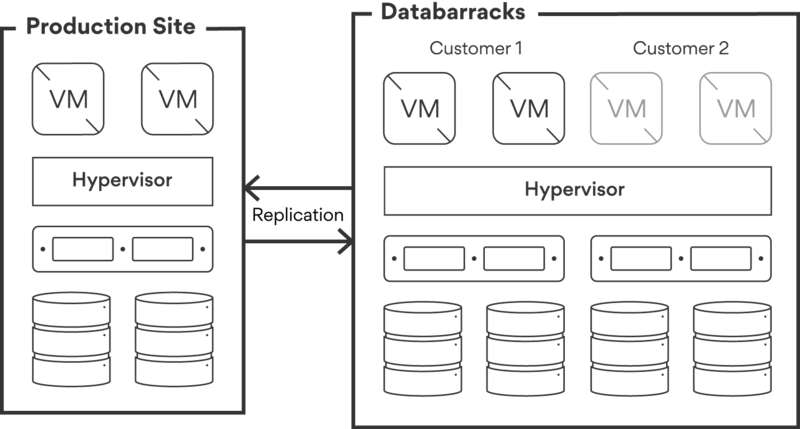 We recommend Zerto replication to Databarracks for virtualised organisations (VMware or Hyper-V) from five servers upwards. The benefits of the cloud, protected underground with the UK’s most secure hosting. Our data centres give you resilience through redundancy and constant availability, removing all single points of failure. Zerto lets you protect, recover and move applications across hybrid and multi-clouds. Best of all, it makes it easy. It combines disaster recovery and cloud mobility in a single converged platform. Rubrik provides asynchronous, deduplicated replication for physical and virtualized environments. This lets you orchestrate data across data centres and public clouds. Use one policy engine to set up backup, replication and archival schedules on-site or securely hosted in the UK from ex-military nuclear bunkers. Define backup and replication policies for your physical and virtualized applications, all in one policy engine. Recover instantly from any VM replica without rehydrating data to another endpoint. Object-Level Recovery: Deliver object-level restores for Microsoft environments (such as MS SQL tables, mailbox and emails for MS Exchange, and MS Sharepoint objects and sites) without a database rollback or restore. Global Real-Time Search: Instantly search for files across all snapshots with suggested search results as you type. We recommend Rubrik to organisations with a predominantly virtualised infrastructure of hundreds of VMs. Rubrik is an exciting new player in backup, recovery and data management. It combines archiving, backup and disaster recovery into a scalable solution with a refreshingly simple interface and approach to set and schedule creation. Using either physical appliances or virtual appliances we protect your source data to our ex-military nuclear bunkers. Rubrik gives you backup, disaster recovery and archiving that’s easy to use, fast and future-proof. You get instant recoveries, automated workflows, easy cloud adoption and money saved – all through one app. 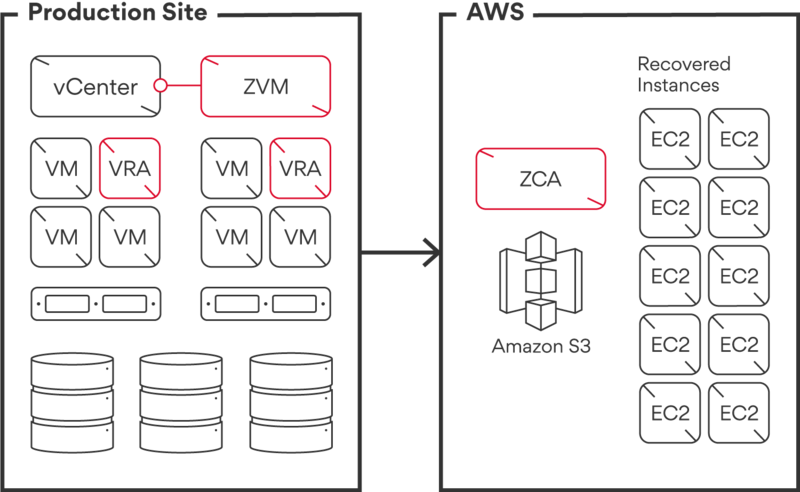 We recommend Zerto and AWS for virtualised organisations using either VMware or Hyper-V. If you’re looking to strategically adopt AWS, or introduce resilience with the global leader in cloud computing, you should explore further. 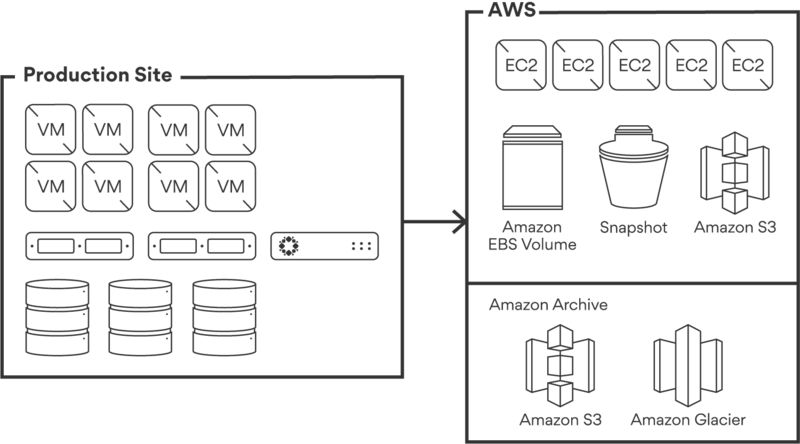 With Amazon Web Services, you can go from small tactical projects through to strategic adoption. It’s enterprise-ready – that includes yours, no matter the size. For backup, archive and disaster recovery into, within or out of AWS, Rubrik won’t let you down. 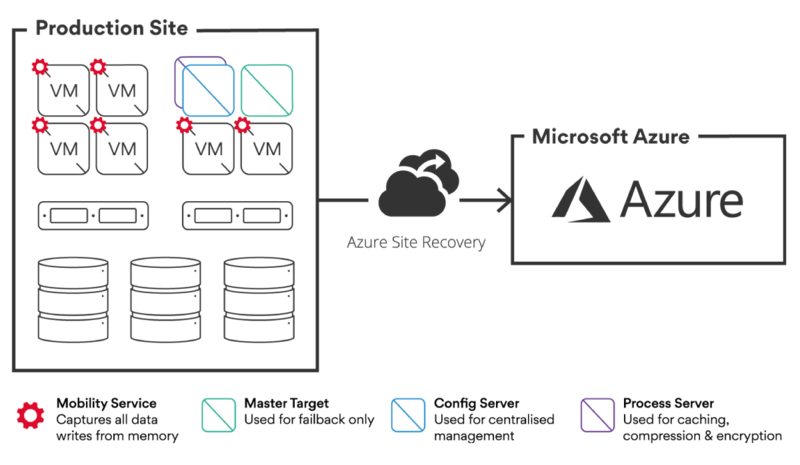 Zerto is the fastest enterprise-class recovery solution to Microsoft Azure. Forget expensive physical DR sites – Zerto can simultaneously replicate VMs on site and to Azure with multi-VM consistency groupings. We recommend Azure and Zerto to organisations who need enterprise disaster recovery and are planning long-term strategic adoption of Azure. In the short-term, you gain resilience and build familiarity of Azure without affecting production systems. Through testing and invocation, you get experience of running production workloads in Azure ahead of your move. Over a decade of providing award-winning cloud services, including production system hosting, backup and disaster recovery services. Databarracks designs, builds and manages your continuity in the Azure cloud. Azure Site Recovery (ASR) lets you deploy application-aware software to the cloud. Orchestrate replication, perform Disaster Recovery tests and run failovers and failback. You can also customise replication solutions on an app-by-app basis. App-consistent snapshots, for single or multi-tier apps. Integration with SQL Server AlwaysOn. Partnership with other app-level replication technologies. ApFlexible recovery plans let you recover an application stack with one click. The plans include external scripts and manual actions. Advanced network management in ASR and Azure simplify app network requirements. Reserve IP addresses, configure load-balancing and integrate with Azure Traffic Manager. All for low RTO network switchovers. Azure Site Recovery is Microsoft’s replication product, but is not limited to Microsoft virtual workloads. Protect VMware or physical machines from your site to Azure, or use ASR for resilience within Azure. We recommend ASR and Azure for small to medium sized environments aiming to minimise costs for continuity. Azure Site Recovery lets you deploy application-aware replication to, and in, the cloud. Orchestrate replication, perform disaster recovery testing, and run failovers and failback. Rubrik provides asynchronous, deduplicated replication for physical and virtualized environments. This lets you orchestrate data across data centres and public clouds. Use one policy engine to set up backup, replication and archival schedules on-site. Auto-discover your entire virtualized and physical environment. Archive to Blob Storage (LRS, ZRS, GRS). Replication within a multi-cloud environment (different Azure regions). Bi-directional replication also available from Azure to an on-premises Rubrik cluster. Install Rubrik as a software instance in Azure and scale protection in-line with cloud service consumption. Automated conversion of application data (VHD) into an Azure Virtual Machine. Rubrik is an exciting new player in backup, recovery and data management. It combines archiving, backup and disaster recovery into a scalable solution with a simple interface and approach to set and schedule creation. See how Discover Recovery can help your business.